While my husband may be the professional builder in the family, this kitchen is all mine! 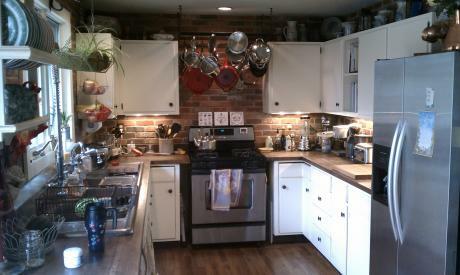 I did the brickwork myself ala Robinson Brick, Denver, Co., painted the original cabinets myself and sourced the best deals on the everything else. -Do It Yourself Plumbing, Denver , CO" for the fabulous stainless sink -Lumber Liquidators for the Maple Block counter tops and -BuildingSurplus.com for the windows which came from some folks doing a remodel in Boulder, CO. I love my kitchen and my family loves what comes out of it!